Our in-house sauna is perfect for enjoying magical moments of relaxation after an eventful and active day in Wagrain. 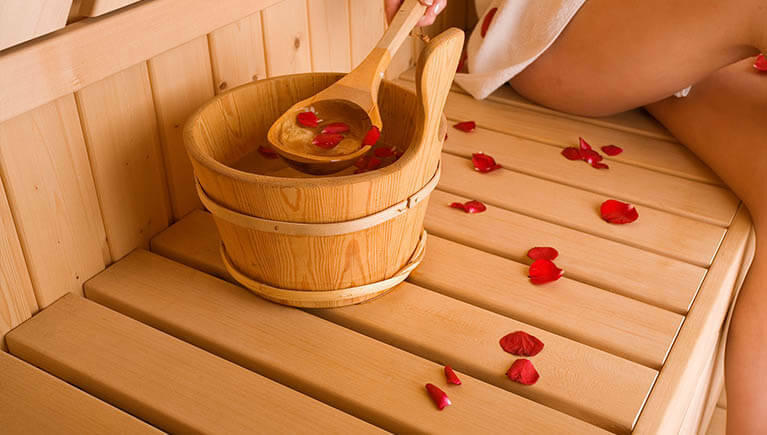 Savour the cosy warmth of the sauna or sit and unwind in our infra-red cabin sauna. Water in our house is “revived” according to the Johann Grander method. Here at the Pension Unterwimm you’ll find a special place full of harmony where you will feel right at home – spend an unforgettable holiday here with us. Treat your body, mind and soul to a relaxing Reiki sound massage. Schenken Sie Körper, Geist und Seele eine wohltuende Reiki-Klangmassage. Petra Gasser, the pension owner is qualified Reiki instructor and life energy expert. I’ve developed my sound massage in combination with Reiki. For many years now I’ve concerned myself with life energie and relaxation techniques. I’ve stuck with the sound massage as I believe this technique quickly induces a feeling of relaxation and well-being. Finding blockages in our body’s energy various bowls are laid on the body. Fine vibrations are created when the bowls are played, which then spread thoughout the body in the form of waves. The person soon experiences a feeling of calm and can relax. Body, mind and soul enjoy a harmony – effective for relaxing, creating a free flow of energy and body meditation.